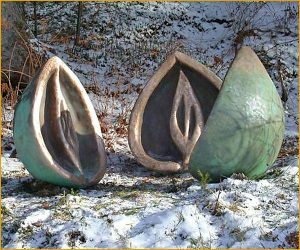 Three different seed segments were shaped by the artist in large blocks of white Styrofoam. Stainless steel skeletons were made for each of the three shapes. 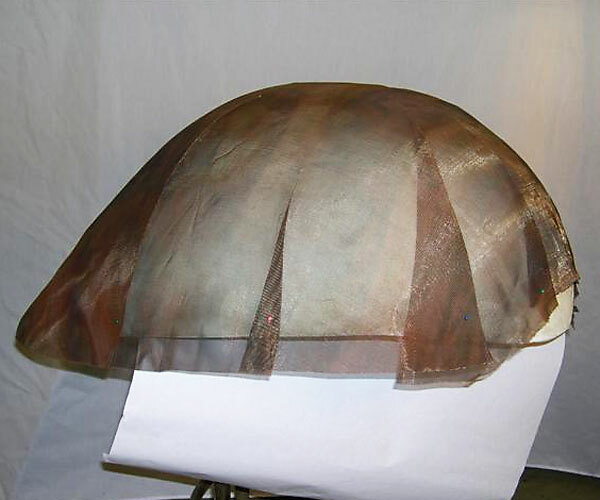 Copper mesh is shaped to the models, back section is shown. 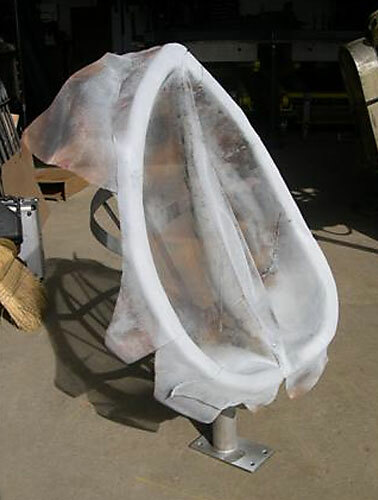 The front half is sprayed with zinc to solidify the shape. The front and back are assembled and sprayed together on the skeleton. The final shape is touched up and sprayed with silicon bronze. It is then highlighted by polishing. 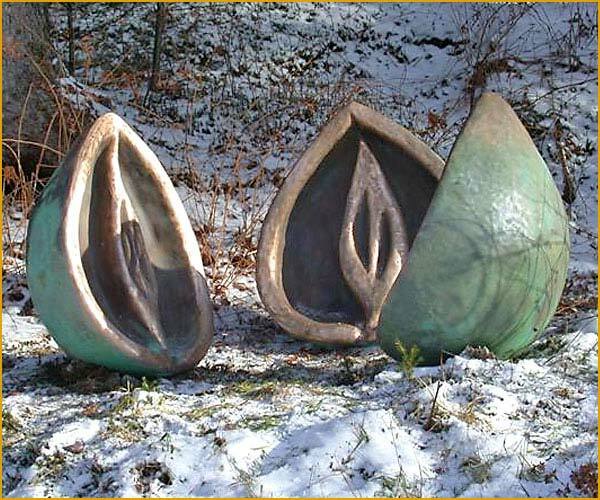 Three finished seed pods with chemical patina. Wire arc thermal spray is a process in which two metal wires on spools are fed to a gun where an electric current forces them together. The wires melt and create a continuous pool of hot liquid metal that is blown through a nozzle by compressed air. This action produces very fine molten particles which are propelled onto a target surface at high velocity where they splatter and cool, creating a dense coating of metal. What is the “Bauer Process”? 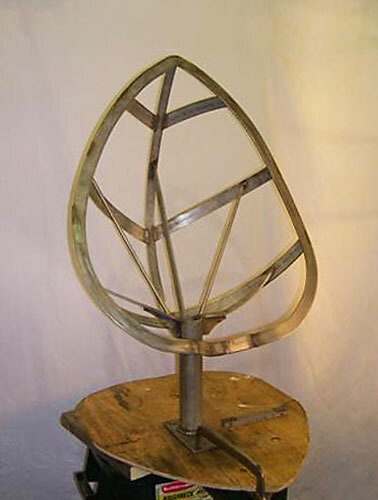 The “Bauer Process” is a patented method of building three dimensional objects by spraying molten metal on wire mesh. We have applied this concept in combination with a myriad of materials to create unique and distinctly beautiful items. What metals can be used? Almost any metal from aluminum to zinc can be melted and sprayed with the “Bauer Process”. Since the resultant coating is 100% metal it retains the basic characteristics of that particular metal, such as base color, durability, corrosion resistance or a pleasing weathered look. Patina is a chemical finish applied to the cleaned metal surface to give it a particular color or appearance. In some cases, it can be described as an accelerated aging process. The resultant surface is then sealed to protect the finish and create a moisture proof barrier that will last indefinitely and is impervious to almost all solvents and liquids. Occasional cleaning can be done by using a cloth with soapy water or window cleaner. After drying, an application of quality furniture wax is recommended. How thick is the metal coating? This depends on the application and the number of passes made over the work piece. Generally, it will vary from 1/32” (.0030 in.) to 1/8” (.125 in.) or more. Site conditions and the environment influence longevity. Silicon bronze has been the time-honored choice for outdoor sculpture because it can last for centuries. You should expect decades of enjoying the look of our products.